International Launch Services (ILS) are in action on Friday, as the countdown clocks ticked down to the launch of their Proton-M rocket. The workhorse launch vehicle lofted the Telstar 14R telecommunications satellite into a geosynchronous transfer orbit. Launch from the Baikonur Cosmodrome in Kazakhstan is scheduled for 19:15 GMT, ahead of over nine hours of flight until a successful depature of the passenger. The Proton M launch vehicle, utilizing a 5-burn Breeze M mission design, will lift off from Pad 39 at Baikonur Cosmodrome, Kazakhstan, with the Telstar 14R/Estrela do Sul satellite on board. 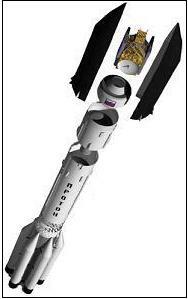 The first three stages of the Proton will use a standard ascent profile to place the orbital unit (Breeze M upper stage and the satellite) into a sub-orbital trajectory. From this point in the mission, the Breeze M will perform planned mission maneuvers to advance the orbital unit first to a circular parking orbit, then to an intermediate orbit, followed by a transfer orbit, and finally to a geosynchronous transfer orbit. Separation of the satellite is scheduled to occur approximately 9 hours, 13 minutes after liftoff. Telstar 14R/Estrela do Sul 2 is a commercial communications satellite built by Space Systems/Loral for Telesat. The satellite will utilize 46 high powered Ku-band transponders (58 36-MHz transponder equivalents) over five coverage beams consisting of: Brazil, the Continental United States (including the Gulf of Mexico and northern Caribbean), the Southern Cone of South America, the Andean region (including Central America and southern Caribbean), and the North and Mid-Atlantic Ocean. Following its launch, Telstar 14R/Estrela do Sul 2 will be located at 63 degrees west longitude where it will replace and augment the communications capability currently supplied by Telesat’s Telstar 14/ Estrela do Sul. It is expected to be in service for 15 years. The spacecraft has the following “Target Orbit at Separation”: Apogee: 35,786 km (22,236 miles), Perigee: 8,850 km (5,499 miles), Inclination: 13.8 degrees. Friday’s launch will be the first of 2011, and the second in the latest series of Return To Flight missions after the December 5 failure of the Russian Federal mission which was utilizing a Proton M Block DM-03 vehicle, resulting in the loss of three GLONASS-M navigation satellites. Overall, the launch is the seventh Telesat Satellite Launched on ILS Proton,the 17th Space Systems/Loral Satellite, the 65th ILS Proton Launch Overall and the 364th Proton mission since 1965.